Sky's Peter Kennaugh cruised to a solo win on stage 7 at Critérium du Dauphiné on Saturday. 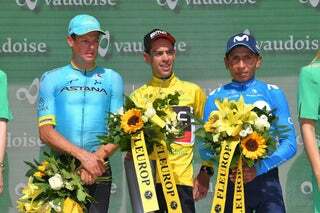 L’ALPE D’HUEZ (AFP) — Australian Richie Porte of the BMC team turned the screws on Chris Froome in Saturday’s seventh stage of the Critérium du Dauphiné won by the latter’s Team Sky teammate Peter Kennaugh. With just one stage to go on Sunday, Porte spurted at the end of a gruelling day’s racing to gain valuable seconds on direct rivals for the overall race victory, putting a further 23 seconds between himself and former teammate Froome, in second at 1:02. Defending champion Froome, a three-time winner of the Tour de France, couldn’t stick with Porte’s acceleration on the last 2km of the 168km ride from Aosta to the epic Alpe d’Huez climb and summit finish via the Col de Sarenne. Astana’s Danish rider Jakob Fuglsang, a silver medallist in the road race event at last year’s Rio Olympics, did manage to tail Porte and now stands third in the overall classification, at 1:15. Froome’s Team Sky teammate Kennaugh, who won gold as part of the British team pursuit team at the 2012 Olympics, soloed to the stage win after pulling away from British compatriot Ben Swift (UAE Team Emirates) in the final three kilometers. According to the offical Sky media report, Kennaugh said he and Swift were on the same page heading into the final as they distanced themselves from breakaway companions Jesus Herrada (Movistar) and Jelle Vanendert (Lotto Soudal). “We didn’t speak much. Over the top of the Col de Serrada we knew because we know each other so well that we’d have good cohesion and could pull away from the other two,” he said. Sunday’s eighth and final stage is another testing mountain ride, 115km long over three cols (Saisies, Aravis, Colombiere) before a final climb to the finish line at the Plateau de Solaison, high in the Alps. How important are June wins to July success?